Note (Not Copyrighted) : This basic post was updated December 10, 2010 given the current debate in Congress over extending the Bush tax cuts and numerous inquires regarding my position in this debate. The purpose of this post is to highlight that although rates are important, perhaps more important are overall fairness issues associated with two situations in particular. Put another way, why don’t we all forget about the rates and focus on basic fairness first. Doing that should allow rates to come down in all brackets. With the financial reform package now passed, all eyes are on the setting of specific rules regarding its implementation. And while lobbyists attempt to direct the debate away from where it should be, let’s instead visit the core issue, tax rules. 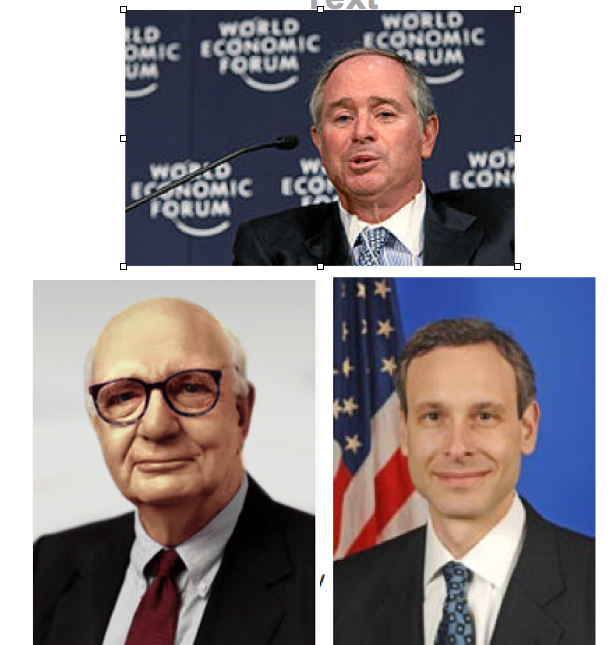 This rollout of specific rules related to the Volcker Rule and related tax considerations will squarely position Paul Volcker, pictured on the lower left below and current IRS commissioner Doug Shulman, lower right, against Blackstone Group LP’s Steve Schwarzman and other leveraged buyout artists operating under the guise of “private equity.” Why are tax rules key one might ask, especially if these rules have nothing to do with the debate over carried interest? This is because two specific tax rules have profoundly shaped the current investment markets via a major impact on cash flow. They have also in a more basic fashion functioned as the seeds from which all the other market dysfunctions have originated. The purpose of this post is to briefly explain these two rules and then connect the dots. Also see related March 31, 2011 post titled Blackstone Tax Engineers, Inspired by GE, attempt to repeal the fractions rule. This post includes brief audio recordings from leading attorneys and an IRS official regarding the fractions rule. 1) Net Operating Losses: This involves the practice of creating large pools of net operating loss tax deductions, mostly from unusable technology firms’ stock option deductions when these firms are bought by private equity funds. These private equity firms then do leveraged buyouts of profitable companies and offset these profitable companies profits into the pool of losses to make the profitable companies tax exempt. Back in the 1980’s this loophole was intended to be closed when Congress prohibited profitable companies from purchasing such losses and using them all immediately. The new law required they be amortized over several years. As former Senate Finance Chair Bob Packwood noted in an Oregonian article, the Treasury never foresaw firms escaping the loophole by using partnerships with large pools of losses to purchase profitable companies. Essentially, the same transaction in reverse. Who would think that a partnership whose primary asset were losses would be able to purchase profitable companies. All that was needed in the legislation to prevent this was the term “and vice versa.” Remarkably, there has been no discussion of this amazing situation, perhaps the biggest tax story in 10 years. 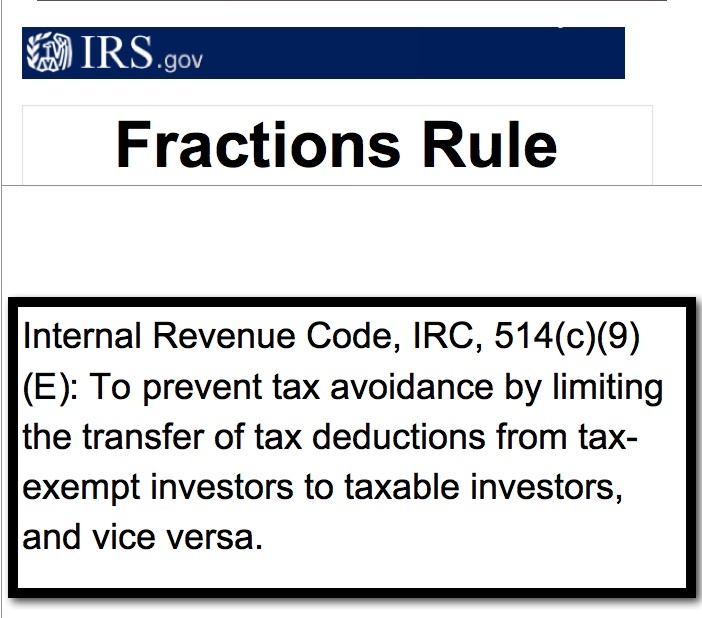 2) “The Fractions Rule” This rule was put in place at about the same time and designed to prevent tax exempt entities such as public pensions from trading tax deductions they were not entitled to use with taxable partners. The fractions rule also was designed to discourage tax exempt entities from investing in leveraged buyouts (LBO’s) via partnerships with private equity firms and other taxable partners. Clearly this would give such firms purchased an unfair marketplace advantage when competing with tax paying businesses. Or put another way, who would be left to pay tax if all the tax paying firms got gobbled up by partnerships in leveraged buyouts fueled with tax exempt investor funds. Presant is pictured below on the left with Wayne Pressgrove of King and Spaulding on the right. These two brilliant lawyers represent the leading private equity and hedge funds. In the ensuing years, once again the industry has attempted to sidestep the fractions rules intent, which applies only to “partnerships,” by using blocker “corporations” set up in the Cayman Islands and other tax havens. As a trained CPA I find this most disappointing since the IRS rules should be based upon the “substance” of the economic activity rather than the form or structure. In any event, there is a whole cottage industry of law firms selling advice based upon such blocker corporation schemes. 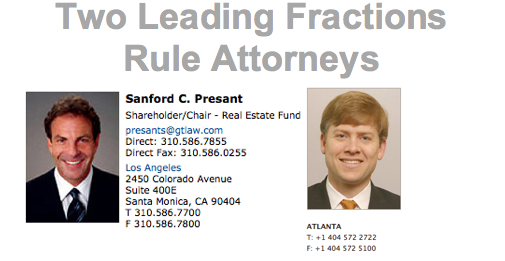 A brilliant team of lawyers at King and Spaulding helped write the fractions rule and key to it is the expression “and vice versa.” This is key because it would prevent the gamesmanship that has occurred with operating losses noted above. Put another way, it would limit allocating deductions from tax exempt to taxable partners in addition to allocating income from taxable partners to tax exempt partners. This is particularly important with compensation, the numbers of which can be particularly large with private equity and hedge funds. Large CPA firms now have entire divisions focused upon transfer pricing and expense allocations yet again one has to ask the question, if these transfers do not have underlying economic effect other than moving deductions around, why is this allowed. It is somewhat ironic that King and Spaulding, the same firm that helped draft the fractions rule, is now leading an effort via the American Bar Association to gut the fractions rule by exempting certain key expenses and transactions. One recent King and Spaulding partner, Dan Coates, was just elected to the US Senate and expressed interest in being on the Finance Committee, which oversees these rules via the IRS. We’ve given up on repealing it all together, the ABA notes, and so we are now trying to be more tactical. This has resulted in the fractions rule becoming what one leading attorney calls the “Mariana Trench” of the Internal Revenue Code. Perhaps it is also why there has been so little enforcement to date from the IRS, as noted by Curt Wilson, Associate Chief Counsel in the the office of Passthroughts and Special Industries, at the 2010 ABA Mid Year Tax Section meeting. Wilson noted, I find this surprising especially given the level of angst in industry over compliance with these rules. See my letter to Wilson opposing granting this revenue ruling. As an investment advisor I find this remarkable given the current debate over extending the Bush tax cuts. While smaller LLC based businesses pay federal, state, property and various other forms of taxes and fees, it appears that these private equity and hedge funds are skirting the rules and paying close to nothing. This of course introduces a significant fairness issue. Again, the fractions rule specifically limits the trading of tax benefits from tax exempt entities to taxable partners, or vice versa. Put another way, imagine if you were a taxable partner in a partnership and 90 percent of the other investors were tax exempt entities? Imagine how difficult it would be to leave 90 percent of valuable tax deductions on the table as unusable? It could be argued that some private equity firms have become but a sophisticated shell for tax avoidance based upon a maze of interconnected companies and effectively converted to tax exempt status through the aggressive use of net operating loss tax deductions involving executive compensation and transfer pricing. This has resulted in an unfair competitive advantage against profitable companies that pay taxes. This has also enraged ordinary small business owners who are not using such schemes. Investors in profitable companies that actually pay taxes get lower returns than they otherwise would have, making competing with such a scheme on a long term basis difficult. The situation is even worse for their productive employees who suffer job losses due to takeovers inspired by this scheme, and essential government services which rely on a broad tax base. This could be the big untold story of the current economic decline, a decline inspired and manufactured by certain private equity firms. It also explains in large part the constant drumbeat of job outsourcing in that the first thing these private equity firms do is outsource everything off shore possible, no matter the long term consequences. Again, Congress supposedly foresaw this potential with passage of the “fractions rule”, Internal Revenue Code 514(c)(9)(e) in the late 80’s, to prevent tax exempt entities from trading deductions they cannot use with taxable entities. One need only examine the growth in tandem of public pensions and private equity investment to see the dimension of this issue. In the 1980’s the big issue was depreciation on real estate being given to taxable partners by tax exempt partners in exchange for other benefits. If this were allowed to proliferate there would be no corporate income tax as private equity partnerships manage companies from a tax exempt status and drive tax paying competitors out of the market with lower prices. One can forget that taxes are indeed one of the most significant business expenses and eliminating this expense would provide a significant competitive advantage for these private equity firms. Private equity funds have grown dramatically since then, most notably Blackstone, KKR and TPG. These firms now receive most of their funding from tax exempt public pensions, foundations and endowments, at times more than 80 percent for particular partnerships. At the same time they are aggressively investing in businesses which derive most of their revenue from government programs. A good example is Blackstone’s recent purchase of Oregon’s largest assisted living center, Sunwest, an entity whose primary source of sales are government medicare and medicaid payments. Somehow the public has been fooled into thinking private equity is something other than a euphemism for leveraged buyout. And while tax exempt investors, mostly public pensions, use sophisticated LBO strategies including these Caymen Island based “blocker corporations” to avoid paying UBIT (unrelated business taxable income), they appear to have altogether neglected the significance of the “fractions rule” and basic economic substance requirements regarding allocations of financial results. Congress set up the UBIT rules specifically to avoid a situation in which tax exempt entities are partners in private equity partnerships and investing in leveraged buyouts, to maintain a level playing field. 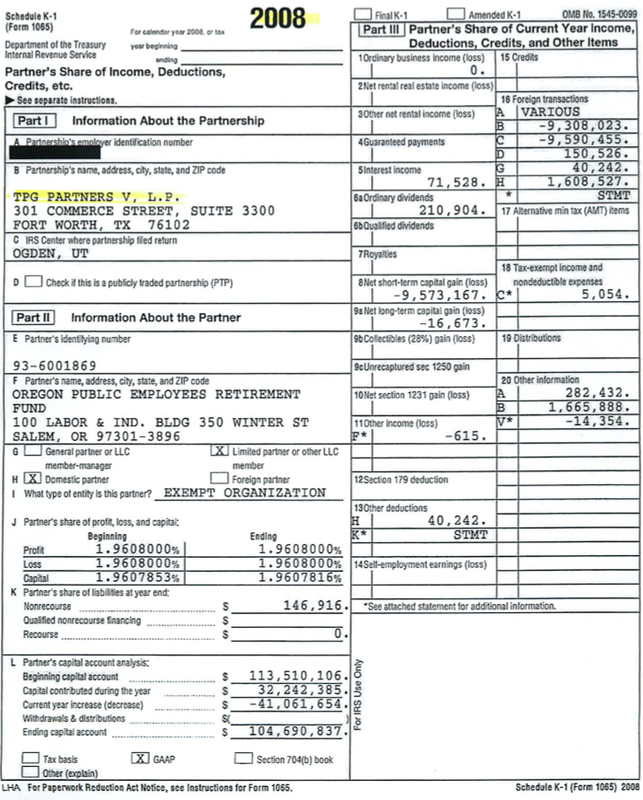 The idea was to tax these tax exempt entities on profits gained from such leveraged buyouts, that is UBIT tax. As noted, the UBIT rules regarding leveraged buyouts have however been circumvented through the use of off shore “blocker corporations” set up as an intermediary so that the tax exempt entities are seen as investing in a corporation rather than a partnership in which activity flows directly to them as a partner, for example profits and tax deductions. Nevertheless, the fractions rule math is pretty simple as follows: if for example 70 percent of Blackstone’s investment partners are tax exempt, then 70 percent of certain tax deductions are unusable and can not be transfer priced or allocated into a situation, whether by using equity compensation, carry fees or other expenses in which they are transferred to and used by taxable partners. While the nation debates whether to tax private equity and hedge fund partners at ordinary or capital gains rates, more interesting is whether or not these partners like Schwarzman are in clear violation of existing IRS tax rules due to an aggressive tax strategy using stock options and carry fees, and other deductions. Once these machinations are fully understood, the tax benefits could be disallowed if the fractions rule has been violated. As an example, let’s briefly examine the Blackstone Group more closely, whose President Tony James visited Portland, Oregon in July 2010. Blackstone is arguably the global leader in private equity investment. They are also a major risk for investment advisers like myself given their ability to takeover good companies and remove them from the marketplace. This makes my job much more difficult, not only in selecting good investments, yet also in maintaining clients who suffer an unnecessary job loss due to one of these senseless takeovers that are now proliferating. Blackstone and other private equity firms including KKR and TPG essentially set up partnerships with tax exempt entities like Oregon PERS, LLC’s, and often have as little as 10 percent of their own equity in the deals. “Tax efficiency reasons” are often cited for private equity funds’ low equity participation. The partnerships then do buyouts of both public and private companies. The above agenda summary is from a recent presentation by Blackstone in Oregon. As Tony James noted in his presentation which led to a $200 million investment in a Blackstone partnership, they can now use Blackstone stock as currency to attract top executives by swapping out their unvested stock options for Blackstone options. That may be convenient yet IRS rules are very clear in prohibiting the trading of valuable tax deductions between taxable entities and tax exempt entities such as public pensions due to abuses in the 1980’s. Specifically, the “fractions rule”., IRC, 514(c)(9)(E) was adopted and it only allows the taxable entities to take their share of economic interest in the partnerships. For example, the taxable partners could only take 100 percent of the equity compensation tax deductions when there are no tax exempt partners. What it also does not allow is an aggressive strategy using transfer pricing and allocations to circumvent the rule. Such strategies may reduce tax exempt entities exposure to UBIT yet the fractions rule must still be met. What the IRS clearly did not want was tax exempt entities like CalPERS and Oregon PERS taking a greater share in profits in lieu of trading unusable tax deductions, deductions they were not entitled to as a tax exempt entity. A related specific purpose of the rule was to provide a disincentive to do leveraged buyouts, thereby capturing large interest expense deductions and allowing taxable partners to avoid all tax on their profits. And while Congress debates whether or not to levy ordinary income or capital gain tax rates on private equity managers, it is conceivable that a tax rate of 75 percent could still result in no tax being paid by general taxable partners such as Blackstone’s Schwarzman. Many creative and aggressive tax strategies have been adopted by large law and accounting firms to try to get around this fractions rule. These firms, once referred to as the Big 8, yet now the “Final 4,” all have large divisions focused on hedge funds, private equity and transfer pricing related strategies, to minimize taxation. In addition to being Blackstone’s auditor, Deloitte is also the auditor of record for Oregon’s private equity portfolio. The question becomes, are the taxable partners at Blackstone using capitalized carry fees and aggressive transfer pricing rules to avoid all taxation? My practice includes roughly 20 PERS participants here in Oregon and I made a public records request for Blackstone, KKR and TPG’s K-1 partnership filings, yet was told that Oregon does not receive them for most partnerships and for those it does, maintains no file of them. Remarkably, the Oregon Attorney General’s office adopted the philosphy that since Oregon PERS is tax exempt they need not ask for nor review this critical document reported to the IRS, but rather rely exclusively on documents prepared by Blackstone, KKR and TPG for information. For this reason the OIC does not even maintain files for K-1’s in general. This is somewhat ironic since the current Chair of the Council is Harry Demorest, former managing partner of Arthur Andersen’s Portland Office. Demorest managed the tax practice at Arthur Andersen before assuming control over the entire office and clearly if anyone should understand the importance of receiving a K-1, it is Demorest. Another council member, Richard Solomon, is also a practicing CPA. The following are samples of the few K-1’s they maintain at Oregon PERS. They are for KKR and TPG and were obtained via public information request. When asked for a simple description regarding the accounting treatment for carry fees, which do not appear directly on these K-1’s as capital transfers, the Treasurer’s office refused to provide this information. One obvious question is why the K-1 capital accounts are so low in relation to the publicly available investment summary by partnership. Many things could explain this yet where is the basic transparency. And why won’t the Oregon Investment Council even disclose the accounting treatment they are using for the significant carry fees being paid to general partners? Also of interest is perhaps that KKR’s K-1 is done on a “tax books” basis while TPG uses GAAP accounting. One could argue that tax exempt investors have nothing to gain from receiving a K-1, yet that is simply ridiculous. The K-1 is a key document that includes information regarding values, distributions, etc. My guess is that this is prevalent among public pensions and would it not be interesting to compare the K-1’s provided to taxable partners to those provided to tax exempt partners? These private equity firms are famous for providing a wide range of “figures” on key reports and related valuations. 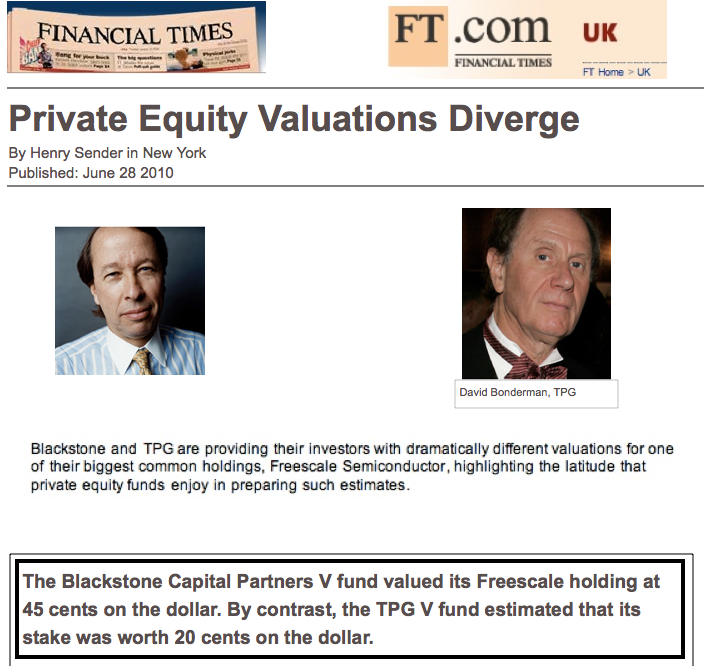 The Financial Times, (see summary visual) has reported that Blackstone valued one investment at 125 percent higher than TPG when even though this investment is in the latter company for an equal amount. These valuations are critical because they drive transfer pricing, related deductions and allocations, etc. Goldman Sachs even has its own internal specialized exchange which values private equity interests and is where many such private equity interests are bought and sold. It is called the GSTrUE system and is only accessible on approved Bloomberg terminals. Remarkably, not even the Institutional Trading areas at TD Ameritrade or Charles Schwab have access. Perhaps this “dark exchange” needs a little daylight cast, especially since the biggest investors in such partnerships are taxpayers via the various public pension systems. Let’s face it, taxes can be boring yet this discussion is important to all investors given that the current level of “buyouts” is removing many quality investments from the market that are later loaded up with debt so that the private equity firms can more quickly earn their “carry fees,” which are generally 20 percent of all profits after returning the original investment to partners. What also results is a job destruction machine that undermines the economy and stability of the financial markets, not to mention the tax base. Most importantly, this undermines investor confidence with the perception that investing has become an insiders’ game of manipulation. Here is a summary of a few potential “discussion issues” to consider affecting just one private equity firm, Blackstone. 1) The CEO of Blackstone Tony James noted in a public meeting in Oregon that Blackstone options are being used in exchange for unvested options for various purposes, including attracting key management talent. He also noted that Blackstone uses numerous internal “non-profit” cost centers to serve its various portfolio companies in the subsidiary partnerships, many of which have tax exempt investors. The question becomes how this impacts transfer pricing and the allocation of valuable tax deductions. One related question is the following: by manipulating the cost of products and services provided to portfolio companies, are they essentially creating compensation related carry/stock option tax deductions at the Blackstone level to be allocated to taxable partners, when they belong to tax exempt investors and should be unusable? 2) Blackstone’s 10K for the period ending 12/31/2009 does not disclose what would be material adjustments for disallowed equity compensation deductions belonging to tax exempt investors. These pertain to equity compensation in which the executives provide services to portfolio companies. 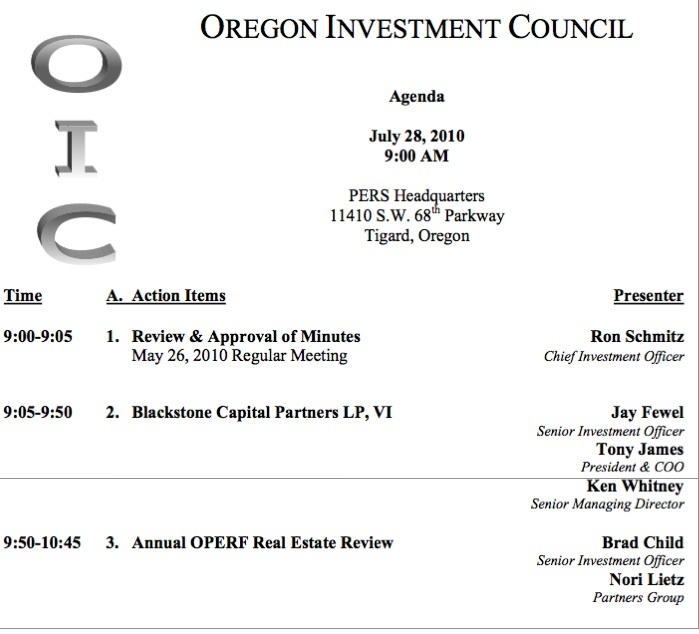 At the July 2010 Oregon PERS public meeting, James used the example of hiring Gerry Murphy of Kingfisher, one of the UK’s largest firms, by swapping his unvested options for Blackstone options. James also highlighted the service Murphy provides to specific portfolio companies in the partnerships. If Blackstone is creatively allocating expenses to its various partnerships, why hasn’t it disclosed the portion of this equity compensation and other related deductions which should be disallowed because they belong to tax exempt partners via an allocation of related expense. Blocker corporations may solve their UBIT tax issues, yet the fractions rule must also be independently satisfied. Many other related questions arise when exchanging options for firms acquired. These deductions need to stay at the acquired firms, yet their value would have been created by the transfer of the Blackstone options, even if the Blackstone Group LP company is not taking a deduction. 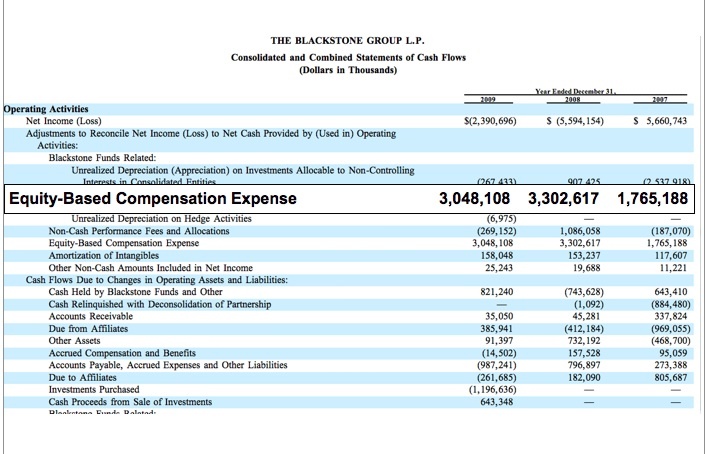 Where is the disclosure in Blackstone’s 10K regarding the disallowed carry executive compensation expense? The firm recognized almost $24 billion of such carry related compensation expense reducing its income by more than $3 billion in 2009. 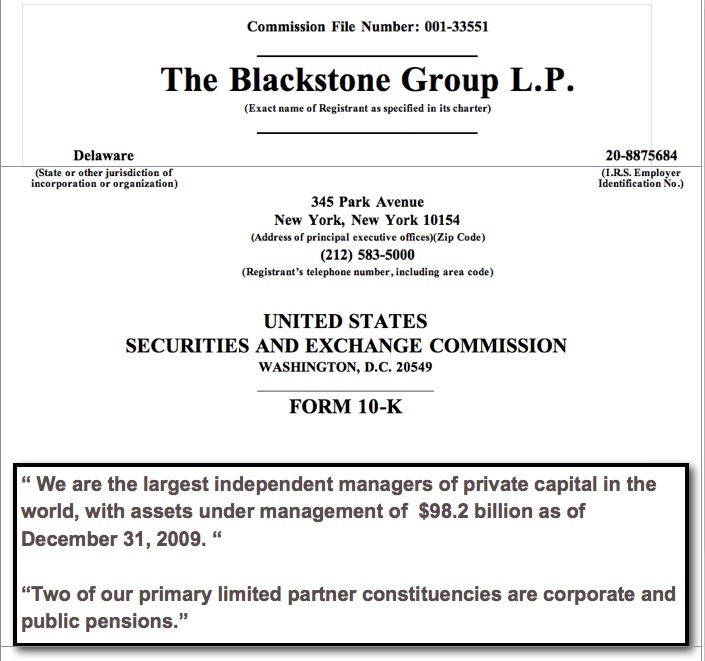 3) The Blackstone 12/31/2009 10K displays the line item stating “non-cash equity compensation” of $3 billion. This resulted in a net loss as shown of approximately $2.4 billion in 2009. If this entire amount of equity based compensation listed above pertains to a tax deduction, as it usually does with respect to such a line item on a “cash flow statement,” this would imply that Blackstone pays no federal income tax for activity in 2009. Granted they may indeed pay tax related to other areas, for example, property tax, timing differences from prior year. The key question becomes, how much of this equity compensation amount pertains to services provided to portfolio companies and what part should be disallowed given that the portfolio company is now partly owned by a tax exempt entity? Also, is this a material omission by Blackstone’s auditor, Deloitte? 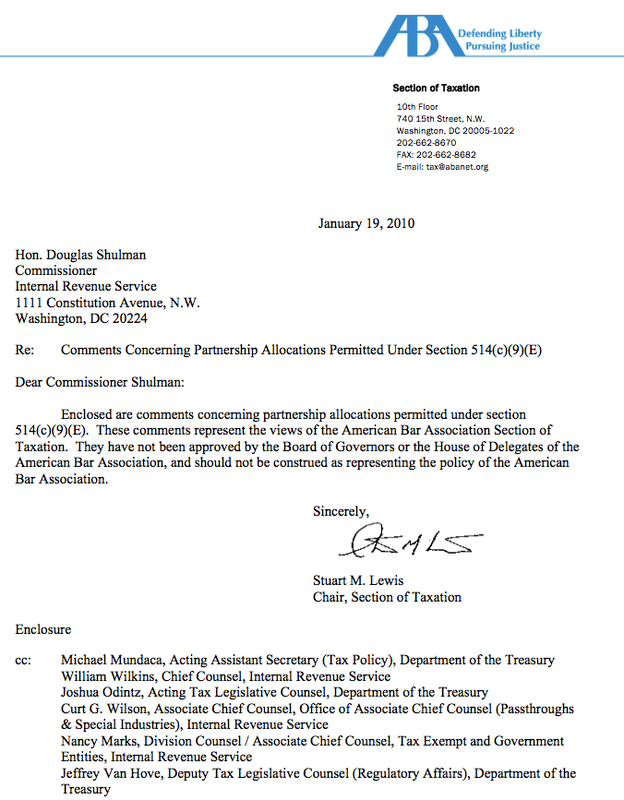 4) The Chair of the Section on Taxation for the American Bar Association wrote the following letter directly to the IRS commissioner Doug Shulman on January 19, 2010 concerning partnership allocations permitted under section 514(c)(9)(E). What he is specifically asking for is a revenue ruling to permit more aggressive strategies with respect to the allocation rules regarding partnerships with tax exempt entities, i.e, violating the spirit of the fractions rule. The entire letter with extensive comments can be accessed on-line with a Google search. Following the letter in this blog post is a list of clients for the lawyer whose firm King & Spalding was a key contributor in authoring the letter. The key attorneys noted as contacts involved with drafting this letter to IRS Commissioner Doug Shulman on behalf of the American Bar Association are the following. In a testament to their legal prowess, the first attorney noted works for King & Spalding, a firm that lists three of the four largest CPA firms, Price Waterhouse Coopers, Ernst & Young and KPMG as clients, along with Goldman Sachs, Citigroup, Bank of America and Wells Fargo. At the same time the ABA is seeking a revenue ruling waiver from the IRS, the private equity and hedge fund industries are pursuing a simultaneous track in Congress. This was introduced in the 110th Congress and reintroduced as H.R.3497 in the 111th Congress. Both bills are sponsored by Sanford Levin of Michigan (not to be confused with younger brother Carl Levin in the U.S. Senate). H.R. 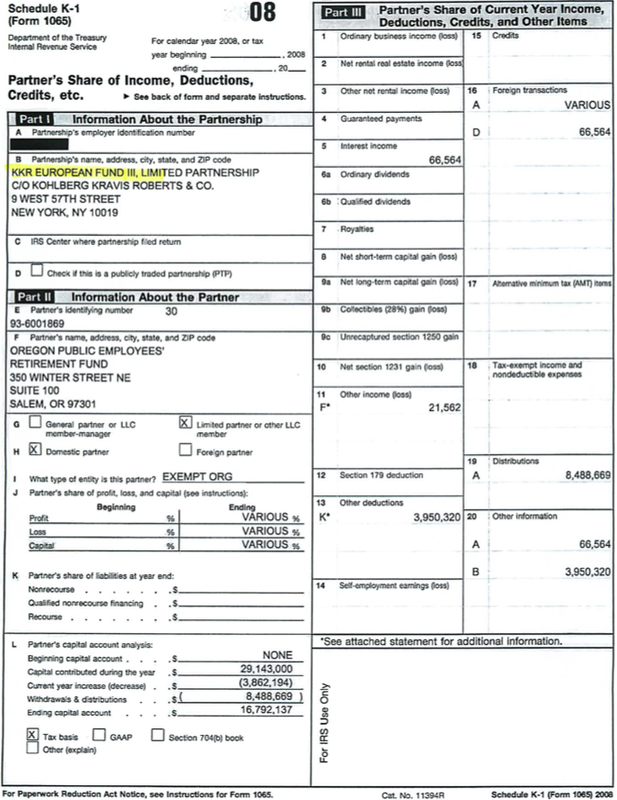 3497 has only three co-sponsors and has been referred to the appropriations committee where Sanford Levin is chairman. Perhaps most interesting is that at the same time U.S. Representative Sanford Levin is introducing a bill that could dilute the fractions rule, he is also introducing another bill, H.R. 1935, to tax private equity partners at ordinary income rates. The irony is that his one bill, H.R. 3497, could indeed result in no tax, regardless of the rate. Meanwhile his younger brother Carl Levin is co-sponsoring a bill with Jeff Merkley of Oregon designed to help states avoid teacher layoffs. Carl Levin has also been a leader in the effort to reform stock option accounting. It is unfortunate that a key driver in the funding gap in state governments is increased Public Employee Retirement System contributions due to significant investment losses and concern over the lack of liquidity with respect to their private equity portfolios. I have some simple advice for the current administration. Aggressively enforce the fractions rule and prohibit tax exempt organizations from using blocker corporations or any other vehicle that ultimately results in a leveraged buyout within three years of a firms’ acquisition by a partnership in which they participate. If we simply eliminate the fuel for these senseless takeovers, that is tax exempt pension and endowment money, we’ll go a long way toward protecting good companies along with their employees and current investors. 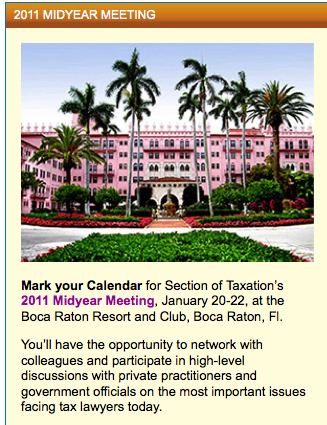 For those of you wanting to enjoy a little Sunshine and rub shoulders with Wayne Pressgrove and other key voices from the American Bar Association in this debate, including leaders at the Internal Revenue Service, consider attending the upcoming conference in January at the Boca Raton resort. Details are provided below. Perhaps it is somewhat ironic that indeed the Blackstone Group now owns the Boca Raton resort via one of its real estate partnerships.